A technician at work on an ARL study of air quality in Modesto, California in 2010. Photo courtesy of ARL, NOAA/Flickr. You’ve probably never heard of the Air Resources Laboratory. I hadn’t until two years ago, when I was hired to preserve a trove of oral histories recorded in the early 1990s. Those audio cassettes held a history of hidden science, full of amazing stories about nuclear explosions, air pollution, and volcanoes. I encountered scientists whose research had strengthened national security, improved emergency response, and protected human health for almost 70 years—with barely any credit or acclaim. And with the lab now under threat of budget cuts, it’s all the more important to understand its little-known history. The Air Resources Laboratory (ARL) researches atmospheric transport, dispersion, and diffusion—how dangerous things move around in the air. It is part of NOAA (National Oceanic and Atmospheric Administration), the government agency that monitors the oceans and atmosphere to help individuals, businesses, and the government make informed decisions. 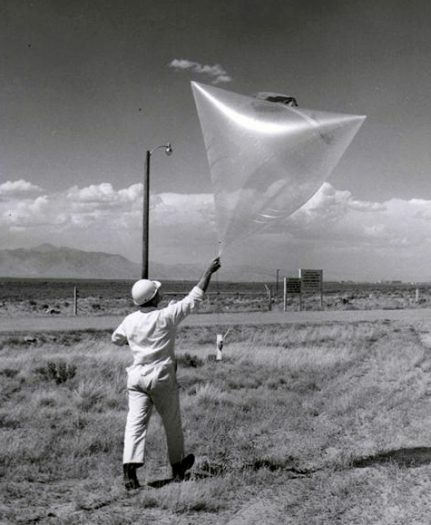 A tetroon being deployed by an ARL technician, 1950s. Photo courtesy of NOAA. The ARL began in 1948, as a handful of security-cleared Weather Bureau meteorologists whom other government agencies could rent to answer questions about nuclear fallout. The lab met its first challenge a year later, when an Air Force “bugcatcher” trapped radioactive dust during a flight between Alaska and Japan in 1949. ARL scientists tracked the air mass backwards to deduce potential sites of the first Soviet atomic bomb test. The Atomic Energy Commission became the ARL’s primary client as open-air nuclear testing intensified through the 1950s. ARL scientists worked in Nevada to delay blasts when nuclear debris was likely to blow over urban areas. The Atomic Energy Commission originally assured citizens that radioactive debris would remain safely suspended high in the stratosphere. But ARL research challenged that claim. The ARL showed that debris would fall out of the atmosphere before most of the radioactivity decayed, and that dangerous fallout would concentrate in the middle latitudes of the Northern hemisphere. This discovery set the stage for the Limited Test Ban Treaty negotiations in 1962; ARL expertise informed sections on monitoring compliance. During the Cuban Missile Crisis, ARL meteorologists prepared daily forecasts for dozens of cities, predicting how fallout would travel in case of an atomic attack. Throughout the Cold War, ARL staff practiced deploying to the doomsday bunker buried beneath Mount Weather in Maryland, where they would track fallout and advise the surviving leaders of the US government during a nuclear war. Nuclear bombs aren’t the only things that shoot dangerous dust into the stratosphere. In December 1989, a 747 flying above Alaska lost all four engines when it flew through a cloud of invisible volcanic ash. The Federal Aviation Administration sponsored ARL scientists to develop a computer simulation that allows airlines to find the most efficient ways to safely avoid ash plumes. Similar models continue to direct global air travel, including during the 2010 eruption of the Eyjafjallajökull volcano in Iceland. As nuclear testing declined and the environmental movement grew, new agencies began to request the ARL’s expertise. The Public Health Service and later the Environmental Protection Agency sought to understand the movement of air pollutants. The lab conducted field experiments to verify its computational models. One smog experiment tracked radar-reflective pyramid-shaped balloons, called tetroons, across the Los Angeles basin. An experiment related to acid rain measured the dispersion of distinctive chemical “tracers” over continental distances. Today, one of the lab’s jobs is to study mercury deposition, a potentially serious pollution problem caused largely by burning coal. The lab met its first challenge when an Air Force “bugcatcher” trapped radioactive dust during a flight between Alaska and Japan in 1949. ARL scientists tracked the air mass backwards to deduce potential sites of the first Soviet atomic bomb test. Understanding atmospheric transport is essential to many kinds of emergency response. The lab’s research guided government responses to the nuclear accidents at Three Mile Island, Chernobyl, and Fukushima. The lab’s HYSPLIT computer model helps the National Weather Service protect first responders during chemical spills. First deployed in the 1980s and iteratively improved since, the model integrates current weather observations with information about a chemical release to predict where toxic substances will go and in what concentrations. In the wake of the Sept. 11, 2001 attacks, the ARL’s Field Research Division conducted tracer experiments in Manhattan and other urban areas to explore how chemical or biological weapons might disperse at ground level. This work can aid emergency personnel in case of a dirty bomb or bioweapon attack. Listening to the scientists tell these stories, I was struck by the absence of self-promotion common in oral histories of Nobel Prize winners or scientist-entrepreneurs. The ARL staff were modest people content to have made a modest contribution to the problems of their time. But this modesty is dangerous in an era when government and science are often denigrated. The government rarely gets credit because the benefits of its scientific services are designed to be invisible, like plane crashes that don’t happen, chemical burns that don’t kill and maim, and people who aren’t poisoned. And the ARL costs less than 2 cents per American per year—NOAA has been famously frugal since the 1930s, when its predecessor, the Weather Bureau, instructed weathermen to write on both sides of every sheet of paper. While the work of the ARL is worth knowing on its own terms, it can also stand in for a swath of hidden science. We think a lot about the kinds of science that are culturally influential, but much less about the science that is practically important. There are many organizations across the federal government like the Air Resources Lab, modest groups of researchers whose quiet expertise makes us safer. We forget about their service at our peril. Dr. Roger Turner is a historian of science and research fellow at the Chemical Heritage Foundation in Philadelphia. He writes about surprising images and atmospheric science at PicturingMeteorology.com.